Kent’s proposal is that Jamie and Victoria infiltrate Salamander’s HQ (using a plan he’d already devised for his own operatives) to find proof of his criminal activities. Given the Doctor’s reluctance to get involved, it’s a little strange that he agrees so freely to this, as it will place both Jamie and Victoria in terrible danger. We’ve seen the manipulative side of Troughton’s Doctor before, notably with his treatment of Jamie in Whitaker’s The Evil of the Daleks, but it’s still difficult to believe that he would agree to such a risky plan so readily. As Jamie and Victoria leave for the Central European Zone, Kent suggests that he and the Doctor take a look at the Kanowa Research Station. They won’t reach there until episode three, but we briefly see inside it this episode, as we meet a character who’ll become more central to the story later on – Benik (Milton Johns). Before we go inside, there’s an establishing shot of the outside of the building. Although it’s represented by a still photo, it’s a nice touch that a small piece of foliage is slowly waved very close to the camera, increasing the impression that it’s a live action shot. It’s a very simple trick, but quite effective. 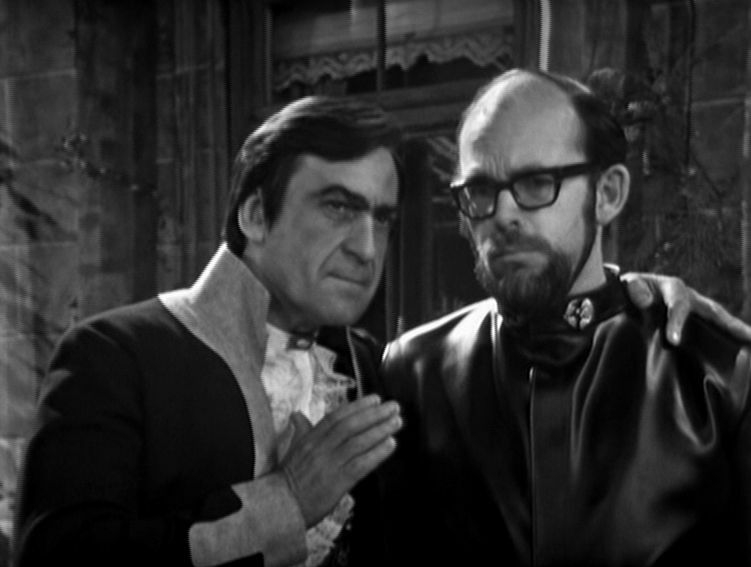 Like many of the actors in Enemy of the World, Milton Johns would make several appearances in Doctor Who as well notching up hundreds of other credits. Frankly, he’s something of a national treasure – one of many, many actors of this era who could always be guaranteed to enliven whatever tv show or film he appeared in. Never the lead, but always solid support. He’s tended to specialise in playing odd, weak or ineffectual characters and Benik fits into all three categories quite nicely. We’ll discuss Benik in more depth later on, but even in his single scene here it’s quite possible to get a good grasp of his character. He occupies a position of some power and he’s no problems with exercising this authority (witness his confrontation with Bruce). But there’s something slightly repellent about him and he certainly doesn’t give off a very trustworthy vibe. We then move to the Central European Zone, where we get our first proper look at Salamander. He’s got an interesting accent which at times does slightly rob the character of a little of his menace, but it’s Troughton, so you know that he’s always going to deliver a nuanced performance that will command the screen. He’s meeting with the Zone controller Denes (George Pravda) and Fedorin (David Nettheim). Salamander warns that the Zone will shortly suffer a devastating earthquake. Denes is polite, but noncommittal, although he promises to have his experts check the data (much to Salamander’s irritation). Denes is another of Kent’s allies, although when he speaks to Astrid later he mentions that the meeting he just had with Salamander was the first time he’d met him. This would imply that Denes has only just been made controller, as surely he would have had contact with him on a regular basis. And since he’s never met him, why is he so convinced that Salamander is evil? Once Denes leaves, Salamander explains to Fedorin exactly what will happen next. Denes will die and Fedorin will take over. Salamander has incriminating evidence (faked, if we believe Fedorin) on Fedorin, but doesn’t plan to use it, “this just an insurance, hmm?” It’s a joy to watch Troughton’s Salamander steamroller the ineffectual Fedorin and it gives us an early indication that he’s utterly ruthless – replace an honest man with one that you have a hold over and your power-base is immeasurably stronger. David Nettheim’s role isn’t particularly large (he only appears in this and the next episode) but his twitchy, anxious turn is a memorable one. Barry Letts elects to use back projection for the park scenes, which is an innovative, if not entirely successful, attempt to suggest the action is taking place outdoors and not in the studio. After the initial location splurge at the start of episode one, the rest of the story is largely studio bound so it was reasonable enough to try and open things out. When he became producer of Doctor Who, Letts would delight in using CSO in ways that few other directors would ever attempt, so it’s not surprising that he tried something similar here. It looks just as fake as CSO often did, but we’ll give him points for effort. The other major character introduced in this episode is Fariah (Carmen Munroe). She’s one of Salamander’s servants, but Fedorin observes that she doesn’t appear to be an ordinary servant. Fariah tells him that she’s his food taster, as there have been many attempts to poison him. As her contempt for Salamander is barely concealed, Fedorin wonders why she decided to work for him. Fariah tells him that Salamander has a way of persuading people and Salamander’s own comments on her are quite noteworthy. “She was hungry. Only thing is, now she has all the food she needs, she’s lost her appetite. 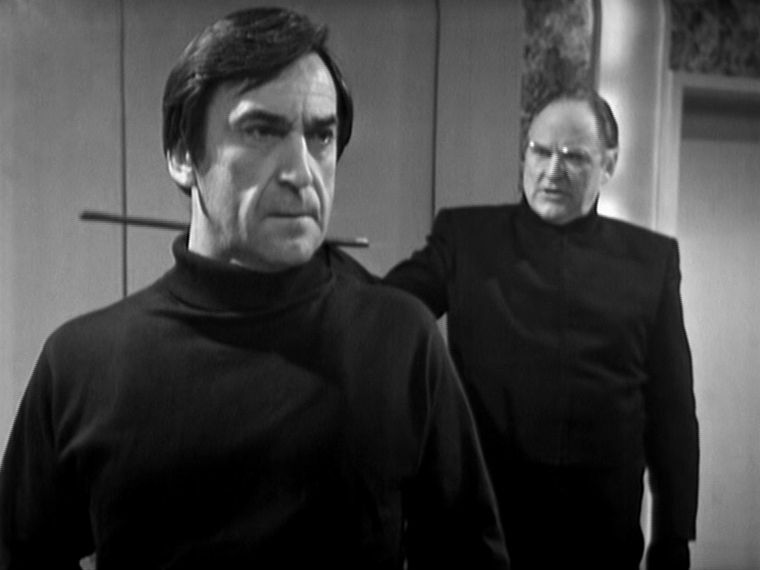 Both Troughton and Munroe are skillfully able to imply an intriguing back-story with just a few lines. Episode two ends with Salamander’s forecasted volcanic eruptions. This is achieved, less than satisfactorily, via stock footage which doesn’t at all match with the clean VT studio sequences. It’s also a little strange that Salamander quite calmly watches the devastation from the veranda in his Presidential Palace, which implies that that the eruptions can’t be too far away. But at no time does anybody suggest that they should leave and move to a safer place. Salamander orders Denes to be arrested and we then see a rather odd cliffhanger which ends on the worried face of Fedorin who’s clearly deciding whether to agree to Salamander’s plan or support Denes. It’s a convenient place to pause the story, but rather atypical (normally we’d expect to see one of the regulars in peril).